Poland’s highest office complex – the Warsaw Spire – is more than an architectural masterpiece. The skyscraper expresses the determined aspirations of the country. The cabling solution for tenant Frontex is outstanding, too. Application: Multi-functional and structured cabling with high-security requirements for offices and data center, high-density distribution systems, MPO and Cat. 6A connection solutions. 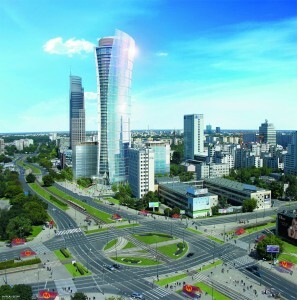 A very demanding tenant moved into the new office complex at the heart of the Polish metropolis, the Warsaw Spire, in the fall of 2014. Frontex, the border protection agency of the European Union (EU), opted to locate its new headquarters here. Frontex was looking for a multi-functional cabling solution for the infrastructure of its 14 600 square-meter office and data center area spread over ten floors – a solution that would satisfy the high-security requirements of the border security agency. The data center had to have plenty of space for servers which is why Frontex was looking for high-density, parallel-optical interface technology. The aim was to build a network that would work without any interruption for ten years and that would provide smooth support for the multifarious tasks of the agency. Every day there is an incredible number of messages, data, images and videos to be processed. The network in the Frontex Headquarters is based on the latest and most powerful copper and FO portfolio from R&M for structured office and building cabling as well as for data centers. Particularly the high-density products as well as the MPO, LC-Duplex and Cat. 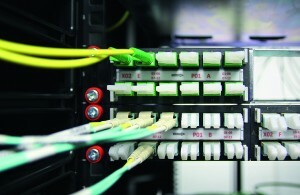 6A connection solutions ensure outstanding performance, sustainable performance reserves and future effectiveness. The infrastructure of the data center is based, among other things, on 150 HD fiber modules with MPO connections and 30 HD fiber modules with LC Duplex ports as well as 45 HD panels with Cat. 6A modules. The infrastructure of the office floors comprises, among other things, 3000 Cat. 6A outlets, 160 HD Cat. 6A panels, 500 LC Duplex outlets and 80 HD fiber modules with LC Duplex ports and splice connections. Five hundred pre-terminated FO cables were delivered to connect the FO outlets. The team worked like clockwork to professionally and punctually integrate the installation into the new building. 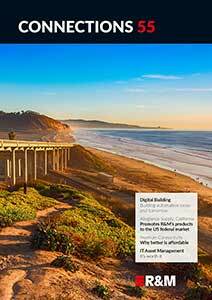 The Warsaw-based R&M installation partner Techlab was once again able to demonstrate its expertise. The previous Frontex Headquarters had also been fitted out by R&M which meant the border protection agency was familiar with the cabling system and could pick up operations immediately when they moved into the premises.